Aaron Jarvis could, this season, be celebrating promotion to the Championship - with Luton Town, his parent club, sitting at the top of League One in England. Instead, it's a relegation battle for the youngster - but that doesn't phase him. 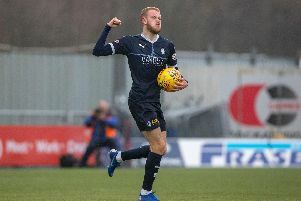 Speaking after Falkirk's 2-1 home defeat by part-time Alloa Athletic, Jarvis told the Falkirk Herald what is needed from the group of players. "We need to want to run through brick walls for the next four games. Show determination, be resilient, win your 50/50s and for the 90 minutes just give your all - 100%. "(Relegation battles are) good character building and teach you to see games out when you have a lead and to not throw away the lead when the opposition have minimal chances. And then to put the ball in the net when you have yours." Falkirk have four matches left, with top two Dundee United (A) and Ross County (H) still to play - but first comes a trip to rivals Dunfermline, before a home match with new rivals Greenock Morton. "We have got to go to Dunfermline and start quickly," Jarvis added. "Put crosses in the box and I'm sure we will get the result that we need. "It's still in our hands. The games that are coming up can still have an impact on our future and we need to be positive and battle. "We don't want any passengers - we need everyone giving 100%." Luton Town's new striker, Jason Cummings, bagged on Saturday as they grabbed a 2-2 draw with Blackpool. Their other forward is James Collins - English League One's player of the season. So Jarvis, who came on at half-time against Alloa, is well used to competition. He added: "I felt good (against Alloa). I felt that I brought players into the game. "I'm just devastated about the result, really. For my late chance, I felt I had got a sweet connection on it - anywhere else in the goal and it is in but I've hit the keeper. On another it goes in the corner and we take a point. "I felt that from the first whistle we dominated it and got balls into the box to test the keeper. Hopefully we can create chances like that going into the next couple of games and score some goals." 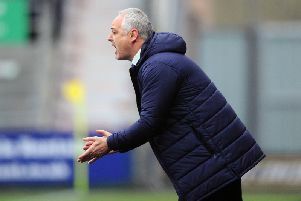 Falkirk boss Ray McKinnon: "We have never ever gone out to be negative"